When I was a kid, there was a big water buffalo living in the vacant lot at the end of our street, the one with the grass that no one ever mowed. He slept most of the time, and ignored everybody who walked past,unless we happened to stop and ask him for advice. Then he would come up to us slowly, raise his left hoof and literally point us in the right direction. I am a little unsure how to actually review this book. It is classified as a graphic book, but to me, it appeared more as a short story book with pictures. The stories are beautiful and poignant and full of meaning. Not that I always really understood the moral of each story, but they were very interesting to read, with such beautiful graphics to look at. I actually think that Shaun Tan describes his book much better than I could possibly imagine. So I have taken a snippet from his website to allow him to explain this book better. I hope that makes it clearer for you, it definitely made it clearer for me. How I wish I had read that passage before I read the book. It actually makes me want to go back and read it again, with that passage in mind. I do feel that that passage should be written in the front of the book to aid the reader before their journey through the stories. The best description I can give you of this book is surreal but interesting and beautifully illustrated. Definitely a book that deserves a peep. Blodeuedd - Surreal, most definitely. Clover - That is why I picked up a Shaun Tan book, as everyone keeps talking about him. I got mine through the library. I enjoyed this one, but I admit it's my least favorite of the three Shaun Tan books I read. Surreal? Hmm, not too sure I like the sound of this. A great cover though. I loved this book and thought the illustrations were out of this world! I read one of his other graphic books - The Arrival, which had no words. I've been meaning to pick this one up for a while. I really must go pull this off my daughter's shelf and read it! 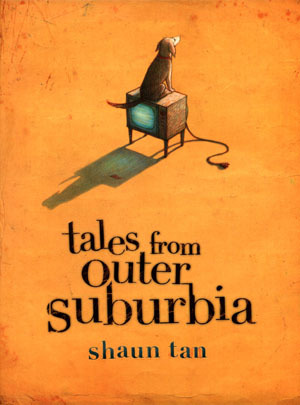 I love Shaun Tan and this collection is beautiful. I think you nailed it; it's not so much a graphic novel as a collection of illustrated shorts. I wish I had purchased this book instead of gotten it from my library. Oh I'm so glad you read this one :D I really loved it! But then again, I love everything that Shaun Tan does!! And I will peep if I see the book in the bookstore. Thanks for the review, Viv! It sounds interesting! 'a sea creature on someone’s front lawn'-that would definitely grab my attention. and will be one I re-read. I am a fan of short stories anyway which added to my enjoyment of this offering. Tan's art and writing are so fantastic that I wish he had more stuff out there. I hope he proves to be a prolific artist/storyteller over the coming years.